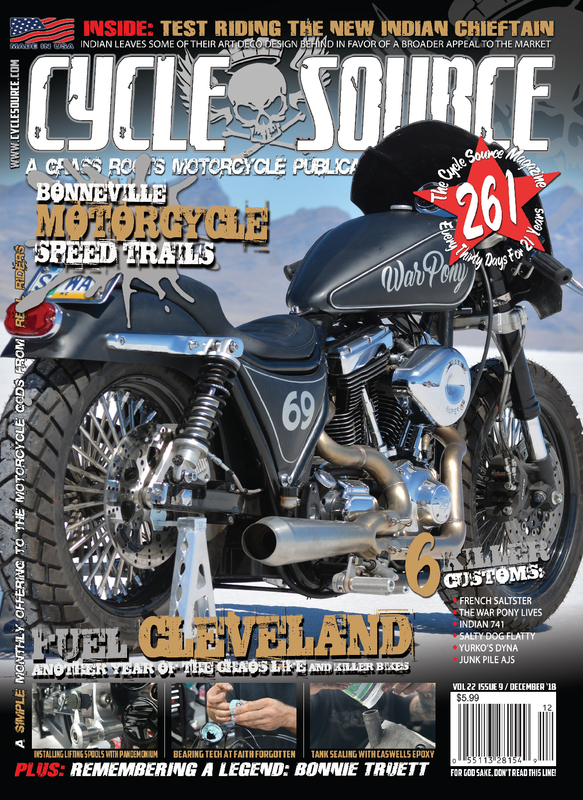 War Pony, a full circle build that brings our own Chris Callen back to the salt, graces our cover this month. Chris and Heather visit the Bonneville Speed Trials for the first time in years and tell tales of sportsmanship, camaraderie and legends on the Salt. We jam-packed it with 6 killer bike features, stories of the road from Chopper Charlie and Scooter Tramp Scotty. Ken test rides the 2019 Indian Chieftain, and Savannah visits the Rust Belt. We offer up three tech articles from some of the best in the business including installing lifting spools with Daniel at Pandemonium and a bearing tech with Corey at Faith Forgotten Choppers.